By mid-season the Minnesota Wild playoff hopes had all but disappeared – until they traded traded for Devan Dubnyk from the Arizona Coyotes. This trade paid out incredibly well for the Wild as “Ironman” Dubnyk won 29 games out of 39 starts. With this amazing performance they qualified for the playoffs and then sent the St.Louis Blues packing in the first round. Mike Reilly Sweepstake: Mike Reilly was originally drafted by the Columbus Blue Jackets back in 2011. He joined the University of Minnesota where he spent the last three seasons playing for the Gophers. In summer, Reilly opted out to sign a deal with Columbus and the sweepstake was about to start. Several teams tried to sign the free agent but in the end Minnesota won the race. 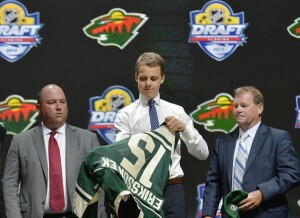 The signing of Reilly was a big boon for the Wild who were in desperate need of left-handed defender. 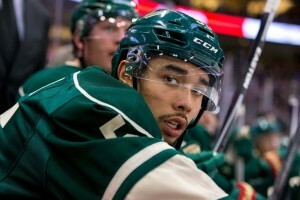 Mathew Dumba’s coming out party? The Wild’s first round pick from 2012 played 58 regular season games last season and is looking to have his break-out year in the coming season as he is believed to take on a more dominant role with the Wild. The 20-year-old from Regina is a spectacular offensive minded defenceman. His skating mobility and offensive upside are comparable to Reilly’s skills but Dumba definitely plays with more grit. He is a good hitter and likes the physical side of the game as well as the skilled one. Deep on center: The Minnesota Wild are pretty deep on the center position with Mikael Granlund, Mikko Koivu, Charlie Coyle and Erik Haula. Their only high-end center prospect Joel Eriksson-Ek will therefore have to compete hard for a roster spot in the coming years but would fit well into a third or fourth line role based on his playing style. The top three players on the Wild Prospect List have a strong chance of making the NHL and being impactful when they do. In addition, there will likely be some of the others who make the NHL, but they are either less likely to have an impact or less likely to make the NHL. Possessing three impact players is a little less than the average amongst NHL teams. The big gap from their top three to the rest of the prospects in the system is quite significant and should be worrying for the organization. Editor’s Note: The Wild prospect pool is pretty hard to rate as their top three are high-end but after that there is quite a decrease. This is also reflected in the ratings. E-Mac had them ranked 27th, while I had them 17th. Two colleagues ranked them in the bottom five while Chris Ralph had them at 22nd. Joel Eriksson-Ek was the Swedish player with the most outstanding performance in a disappointing “Tre-Kronor Team” at the U18 Worlds in April. His playing style stands out as he likes to get involved physically and is a frequent participant in after whistle scrums. Eriksson-Ek works very hard on the ice, never takes a shift off and isn’t afraid to get his nose dirty. His two-way game is very solid and he backchecks really well. He drives the net hard and tries to be under the skin of his opponents. Eriksson-Ek played half of the past season with Swedish club Farjestad BK and will continue to develop his game against men this season. I thought the Detroit Red Wings might pick him up with their 19th overall pick but with Eriksson-Ek’s playing style he just fits perfectly into the Wild organization too. It is probably a toss-up between Reilly and Eriksson-Ek for the top position of the ranking but considering the age difference we went with the Swede as the Wild number one prospect. Nevertheless, Minnesota Wild fans have lots of reasons to be excited about the free agent signing which brought Reilly into the Twin City. The offensive minded defender is a great puckmover and shows excellent skating agility, which reminded me a bit of Kris Letang’s skating skills. He likes to join rushes and shows all the skills to become a potential quarterback in powerplay situations. The good news for Minnesota fans is that in my eyes Reilly is NHL-ready. I would be surprised if he spends the entire season in Iowa as I see a free roster spot for him in the Wild’s defensive corps for which he will compete against players like Christian Folin, Nate Prosser and others. Minnesota’s first round pick from last year’s draft, Alex Tuch is a power forward with good size and strong skating balance. He would fit perfectly as a gritty addition to a scoring line as he shows a good combination of size and skill. Chris Peters of “The United States of Hockey” on Tuch: “At 6-3, 215, he has a pro frame already and teams love the size. What makes teams get really excited, however, is the fact that Tuch has some really solid puck skills (and not just for a player at his size)”. Tuch lately caught some attention with his dazzling shootout goal at the Wild development camp. He will head into his second season with the Boston College Eagles this year. I have to admit up front, I am a bit skeptical about Jordan Greenway. That might be because he lacks some consistency. I wasn’t very impressed when I saw him play at the U18 Worlds in April, however, he did put up decent numbers scoring 7 points in as many games. Because of his impressive frame (6’5 and 223 lbs) Greenway often looks like a grown up man among boys. No need to say that he owns the physical battles against nearly each opponent but he doesn’t possess high-end offensive skills. Ben Ker of “Last Word on Sports” said the following about him: “Greenway is a decent skater for his size. He is especially strong on his skates and shows excellent balance”. Gustav Olofsson had a 14/15 campaign to forget. An injury in the season opener costed him the remainder of the season. Despite this set back, he is ranked as number five in the Wild’s prospect rankings because of his matured understanding of the game and his physical presence. The big Swedish defenceman keeps his game rather simple and shows good positioning in his own zone. 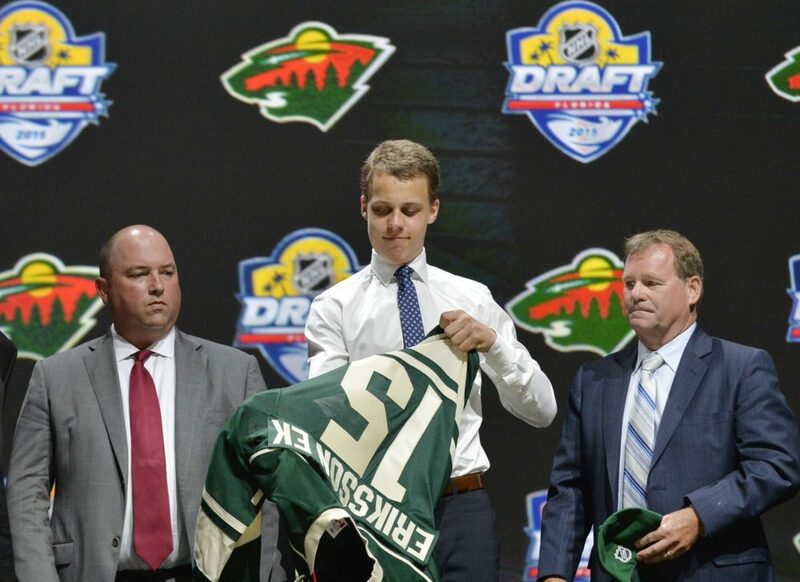 Because of his injury, it might be that many Wild fans have forgotten about the second-round selection from the 2013 draft but this could change soon if he stays healthy this season and starts to pick up the pace with Iowa. The Wild have a couple of interesting defencemen in their prospect system. Towering Carson Soucy, a fifth round-pick from 2014, is no exception. Impressive is that Soucy shows good mobility with 6’4: “He’s a big kid who has good hands and he can skate, he’s got a lot of plays and we’ve seen that through a lot of these games,” said University of Minnesota-Duluth coach Scott Sandelin. “I’m not saying he’s going to be Paul Coffey, but he certainly does a good job moving pucks.” However, Soucy might be a couple of years away from the NHL. #mnwild asst GM Brent Flahr on UMD junior Carson Soucy: "We're very high on Carson … he plays with an edge, big, mobile, great reach." Kurtis Gabriel is the last top ten prospect in the Wild system. He is a player who likes to play with a physical edge. He had his first full season in the AHL and will try to make an impact next season with the Iowa Wild. Gabriel focuses on his own zone game and needs to work on the offensive side of his game, but shows good work ethic on and off the ice.